While we've known about the existence of the Exynos 7420 for a while now, we didn't really know what to expect until recently. Today, it seems that Samsung is ready to start disclosing at least a few details about an upcoming Exynos 7 SoC, which is likely to be the Exynos 7420. 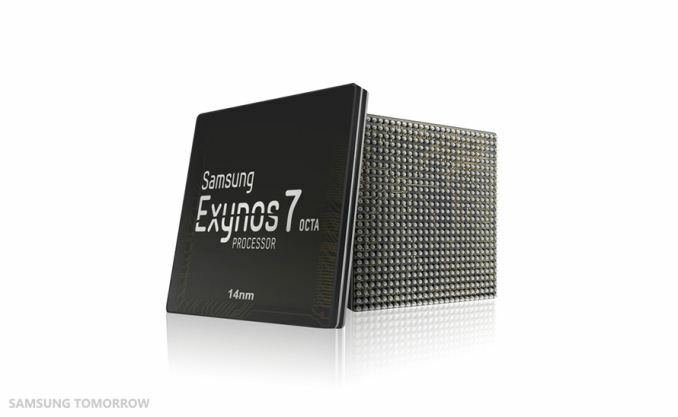 At a high level Exynos 7 will have four Cortex A57s clocked at 2.1 GHz, in addition to four Cortex A53s along with an LPDDR4-capable memory interface. According to Samsung Tomorrow, we can expect a 20% increase to device performance, which is likely a reference to clock speed, and 35% lower power consumption. In addition, there is a reference to a 30% productivity gain, which is likely to be referencing performance per watt. Samsung claims that these figures come from a comparison to their 20nm HKMG process, which we've examined before with the Exynos 5433 in the Note 4 Exynos review. Although there is no direct statement of which version of 14nm is used for this upcoming Exynos 7 Octa, judging by how this is the first 14nm IC to come from Samsung it's likely that this SoC will use 14LPE, which focuses on reducing leakage and power consumption rather than switching speed. Here, since you asked for some proof. What he's saying actually has substance.